From Disney favourites, to inspirational stories and stage adaptations of popular children’s books, there are plenty of theatre productions that are suitable for your students to see. Sophie Evans as Glinda in London’s Wicked. Offering educational benefits including pre and post show downloadable worksheets, workshops and important morals, here are some of the shows that you should consider heading to on a school trip this year. Telling the untold story of two young sorcery students, Wicked follows their adventures in Oz and will see them fulfilling their destinies as Glinda The Good and the Wicked Witch of the West. Curriculum focused workshops, developed by the creative team behind Wicked, will help you to get the most out of a trip to see the show. All suitable for Key Stage 2 and up, the five different workshops you can pick from include Musical Theatre, Drama, Singing, Dance and Anti-bullying. Take your students on a journey to the plains of Africa during a trip to see Disney’s The Lion King on stage. Then, complement your trip with one of the education team’s workshops, providing your students with the opportunity to perform scenes, songs and dances from the award-winning musical, whilst developing core skills such as communication and team-building. Due to conclude in August this year, schools should book in a trip to see Aladdin before it leaves the West End. The show features a colourful set and will have your students singing along to many of the favourite songs from the animated Disney film. Curriculum-linked education resources for Key Stage 2 and 3 pupils are also available, while pre-show workshops for students aged seven and up can be booked. 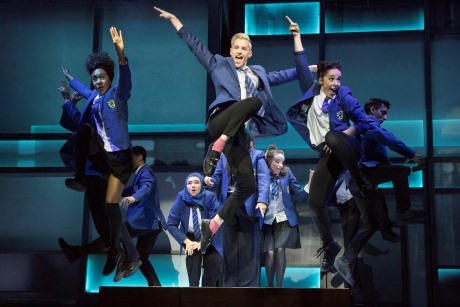 Inspired by a true story, Everybody’s Talking About Jamie tells the story of Jamie as he overcomes prejudice, beats the bullies and steps into the spotlight, surrounded by the support of his mum and friends. A feel good and inspirational story on its own, free educational resources can be downloaded to complement a trip to see the show, supporting studies in English, Health & Social Care, Drama and Music, among others, for Key Stages 3 and up. Heralded as a global stage sensation, Les Misérables is set in 19th century France and is a testament to the survival of the human spirit. School workshops can be booked, which give an insight into the historical context of the production and will encourage students to develop their performance skills. Educational groups can also benefit from discounted admission, teacher packs for Key Stages 3 and 4, and can book backstage tours. Inspired by the beloved book by Roald Dahl, Matilda the Musical follows the story of a young girl who is constantly belittled by her cruel parents, the Wormwoods, and her terrifying headmistress, Miss Trunchbull. But, her unique abilities allow her to stand out and fight to change her own destiny. Schools going to see the show can make the most of pre-show midweek matinee educational workshops, suitable for both Primary and Secondary schools and downloadable resource packs on character, plot, music, dialogue and rewriting. Finally, while it doesn’t have an educational scheme as such, this one has got a moral that you’ll definitely want to instil in your younger students. New for 2019, after it kicked off its UK tour last month, the stage adaptation of Elmer The Patchwork Elephant is now due to travel across the UK until June. The show delivers the message of always being yourself to children, and is a celebration of individuality and the power of laughter. The production is most suitable for Key Stage 1 and 2 classes.